Welcome to Legion, everyone! After a huge break from raiding we were revelling in a new expansion and a chance to kill some bosses again. We have been blessed to have some new and returning faces in the guild, and it has been a pleasure to see Heroic, Mythic and Mythic+ dungeons being traversed in guild groups. We stepped into The Emerald Nightmare with 21 raiders, and thanks to the improvements in logging, I can tell you the average item level for the kill was 841.6. Gearing paths are about as diverse as have ever been, with upgrades from world quests, heroics, mythics, craftables and BoEs all contributing to getting ready for raiding. On the first night of raiding we started out on Heroic Nythendra, and made steady progress as we started to gel, and figure out some things from beta (e.g., tail lash) didn’t carry over to live. We finished the night with a normal kill, and were surprised just how easy it was by comparison. On our second night we secured a good, clean kill on our second attempt and moved back into normal mode before our night was rudely cut short by a ‘restart’. 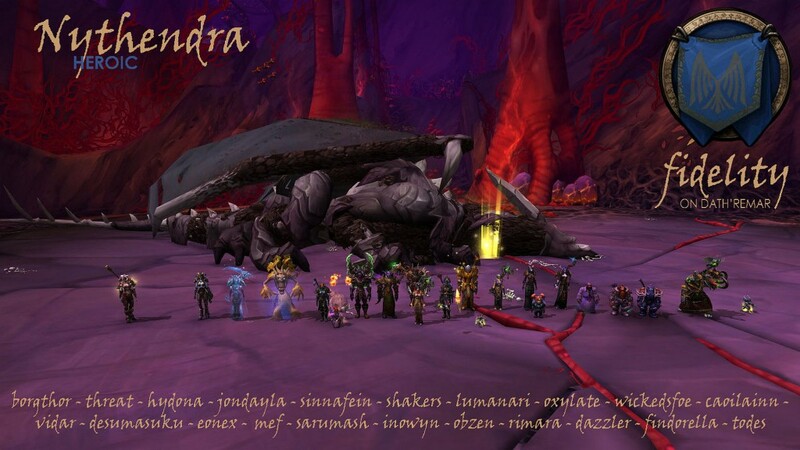 Fortunately we called the raid, since servers only came back after some of us were already soundly sleeping. Sunday night saw us have a rollicking good time clearing normal bosses up to Xavius. Was lovely to get it down. Even if I only saw the fight twice. Also normals on Sunday was fun had a really good night.